Black Friday’s extreme shoppers are coming up with such conniving ways to thwart the competition that some people decided to forgo their Thanksgiving feast altogether. The biggest consumer spending day of the year isn’t what it used to be; with retailers now opening earlier than ever, day-long lines, and watchful policemen, so shoppers have revised their strategies for the ultimate trip in bargain hunting. Taking friends to divide and conquer, camping out for days prior, using sign language to communicate across the store, lying about fake sales, and hiding merchandise before the sale even starts are just some of the strategies that extreme bargain hunters are employing. One 21-year-old college senior admitted to tricking other customers into thinking they could get a better deal elsewhere so that she can cut the queue. Most of the people in front of her fled the store at Jersey Shore Premium Outlets to run over to the candle store. Amanda Willis then made her purchases in under 15 minutes. Meanwhile Louise Sattler, 53, admitted to being manipulatively nice to other shoppers in her Los Angeles area. She said people are then much more willing to help you, if you need your place in the line held while you go to the bathroom, or by letting your child step into the line with you. Louise Sattler’s family is fluent in sign language which they use to coordinate with each other inside loud stores, because “it’s faster than texting”. In Salt Lake City, Utah, Chace Cannon, 26, waited outside all night in six degree temperature so he could purchase a-40 inch Westinghouse HDTV for $299, usually $600. He explained that he and his friends put eight televisions in their shopping carts, and on the way to the checkout, a swarm of latecomers tried to take the boxes. The team raced to a corner and protected their shopping carts until reinforcement friends and family arrived. 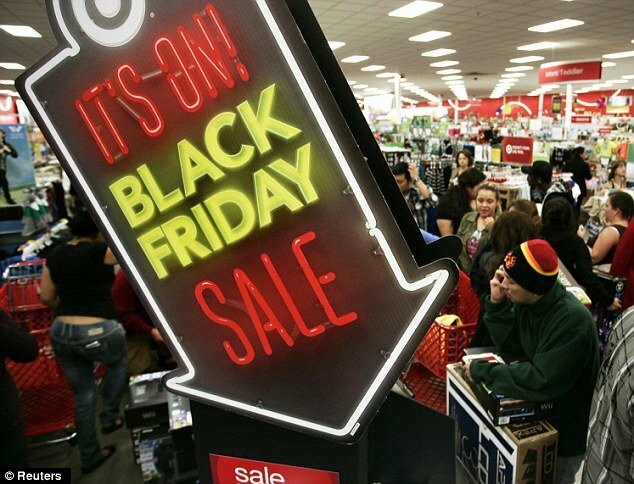 And now that Black Friday is quickly getting supplanted by Grey Thursday with retailers like Best Buy, Walmart and Sears opening their doors yesterday at 8 pm and Target at 9 p.m. means that the rush to get in first has intensified further. Melissa Rush from Florida said she is “hooked” on the “adrenaline high of getting all these great sales”. The 24-year-old’s aim today was to buy a present for each of her 30 different family members, without spending more than $300 total. Using a spreadsheet on her phone that she synced from her computer, a bevy of coupons, price matching, and manufacturer’s rebates, she says it is all about meticulous research. She says it is most important to look at the catalogues from the week before, as well as Amazon.com, to make sure the Black Friday “deals” are actual savings – and to make sure you go with at least one other person who can get into the checkout line as soon as you enter the store. And Holden Hanson, who won’t take any chances in missing out of his must-have products on Black Friday, said he goes to Walmart on the Wednesday before Thanksgiving to hide the items on his list so other shoppers won’t find them. The more sinister elements of Black Friday shopping are still prevalent however. After a Wal-Mart worker was trampled to death in 2008 by uncontrolled crowds, some shoppers such as David Galloway from South Carolina, said his Thanksgiving will be spent with family and watching the great American tradition of football.